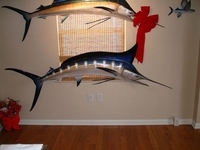 This is a half mount fiberglass replica of a beautiful Blue Marlin caught in Key West measuring 90" in total length. This incredible mount is a true classic. This marlin replica will not peel, fade, or crack and is designed for indoors, outdoors or dockside. This replica is lightweight which makes for an easy installation. Each marlin fish mount overall length is determined by measuring from the tip of the mouth (or bill) and running along the lateral line to the fork in the tail and then running the distance from the fork to the end of the longest tail length. All length measurements have the possibility of being off by a small percentage since we are fabricating in fiberglass using a grinding technique. Many customers choose to purchase smaller replicas during the same order. These replicas can be included into the crate at no additional shipping charges.